Lead generation and qualification are the meat and potatoes of the sales process, but also the source of conflict, infighting and wasted effort at many business-to-business (B2B) companies. 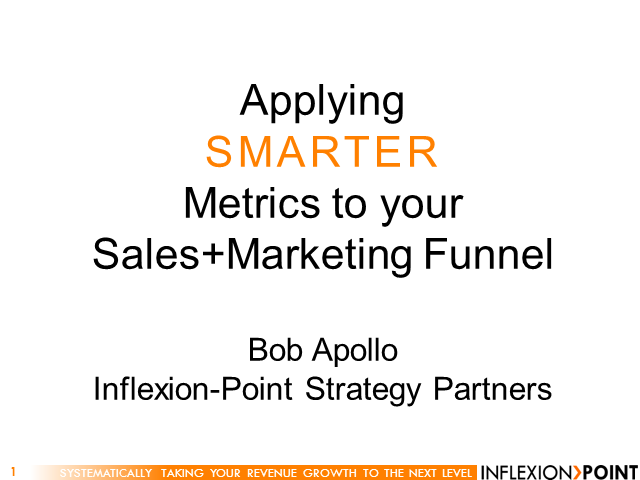 This practical presentation sheds light on the little-known secrets that help you focus your lead-generation efforts, align your sales and marketing organizations and drive revenue. Dan McDade debunks traditional thinking about how to generate qualified leads while uncovering the truths that lead to additional, larger and more profitable wins for your organization. •Most importantly, the top 10 actions you can take today to help you succeed. Dan is a board member of the Technology Association of Georgia (TAG) Education Collaborative, an organization promoting STEM (science, technology, engineering and math) education in Georgia’s middle and high schools. The Sales Lead Management Association named Dan one of the 50 most influential people in sales lead management in 2009, 2010 and 2011. In addition he was named a 2012 Top Sales Expert and one of the Top 50 Sales & Marketing Influencers for 2012 by Top Sales World. Dan is also the author of ViewPoint | The Truth About Lead Generation, a blog exploring issues related to B2B sales, marketing and lead generation. Control your work and help secure sensitive information. Attend this webinar to hear about best practices for implementing security policies and how Acrobat X and Reader X implement security standards. Sales people don't want leads! This statement horrifies marketers and (might) secretly delight sales people. Back in the days of Glengarry Glenn Ross sales leads were a big deal but today sales people want qualified opportunities and anything less than that is not going to warrant a follow up. Buyers cite lack of sales follow up as a source of frustration. How can we move forward? Attend this session and find out. Naylor Gray has 14 years of marketing expertise and he is an Account Director with demand generation agency Bulldog Solutions. Gray leads the account team and serves as the client advocate across all departments within Bulldog Solutions. In addition to providing thought leadership within the industry, he works with leading Bulldog Solutions clients to develop, implement and optimize their demand generation strategies. Tune into these webinars to learn practical advice on improving the process for selling products and solutions.